Bedford Blues travel to Doncaster on Saturday looking for their third away win of the season in the Greene King IPA Championship. 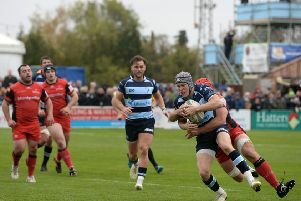 Blues’ 31-21 win over Moseley last week ensured Mike Rayer’s side secured safety from relegation and can go into their final two fixtures without the pressure of possible National One rugby coming to Goldington Road next year. Saturday’s game is the fourth clash between the two clubs since September, and with the Knights ahead 2-1 in the head-to-head stakes, Bedford are out for revenge. Blues head north one place and two points above Donny in the standings, and Rayer feels apart from the top five in the league, there is little to separate the other seven teams. “For sure the top five as it stands have probably been more consistent than the rest, but there’s not much separating the other clubs,” said the former Wales international. “We can all turn around and say if we won that game because of this or that we could be in top four, but I guess the table doesn’t lie. We need to recognise it’s been a tough old season and people have contributed right throughout the squad. On the injury front, there is mainly a clean bill of health within the camp, apart from a sickness bug. James Pritchard is expected to be rested ahead of his appearance for the Barbarians on Tuesday, but Dean Adamson and Ollie Dodge are likely to return to the matchday 22. Rayer added: “There’s been a bug going around the camp for the last two weeks and that’s more of a concern than injuries at the minute. “Obviously guys like Dean Adamson and Ollie Dodge will definitely come into the 22 this week; it’s been a squad effort this year and we need to reward everyone. “But that’s not just to give guys games, we need to recognise it’s been a tough old season and people have contributed right throughout the squad.